James studied dentistry in South Africa where he completed the five and half year course and qualified as a dental surgeon in 1986. Upon graduation he undertook an outreach program in oral health amongst the rural population of Qwa-Qwa, a remote mountainous part of South Africa that borders Lesotho. He initiated, equipped and fully staffed a new Dental Hospital in the same area. 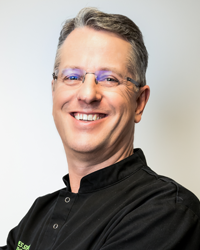 He relocated to the United Kingdom in 1989 and worked in a large general dental practice in Hampshire prior to becoming owner, vocational trainer and Principal Orthodontist in two highly successful general dental practices in Surrey. He is owner and Principal Orthodontist in Weybridge Orthodontics and partner in Kingston Orthodontics. He is a member of the British Dental Association, the British Orthodontic Society, American Association of Orthodontists, the World Federation of Orthodontists, active member of the Croydon Orthodontic Study Group and founder member and director of the OrthoProgress group. James provides treatment for all age groups using both fixed and removable appliances and has a particular interest in the combined restorative and orthodontic treatment interface. He loves the challenge of creating the best smile and face and employs the very latest orthodontic techniques including invisible and cosmetic braces. James is a certified GOLD Invisalign practitioner. James has been living with his wife, Marie-Louise and daughter, Emily and son, James in the Weybridge area for over 20 years. In his spare time, James is a keen amateur rugby referee and a very keen golfer. James is a Specialist Orthodontist in Weybridge, who provides a wide variety of teeth straightening brands and systems to help patients. Including Invisalign and Incognito.